We understand that it’s sometimes helpful to have different ways of accomplishing the same task. And let’s face it, you can’t have too many import options. That’s like saying I have too much closet space! The Nuxeo CSV Importer gives you the ability to bulk-import hundreds of thousands of documents with their metadata (and binaries) into your Nuxeo repository. Awesome, right! Clicking on the Import a CSV file button will present you with a file chooser window. 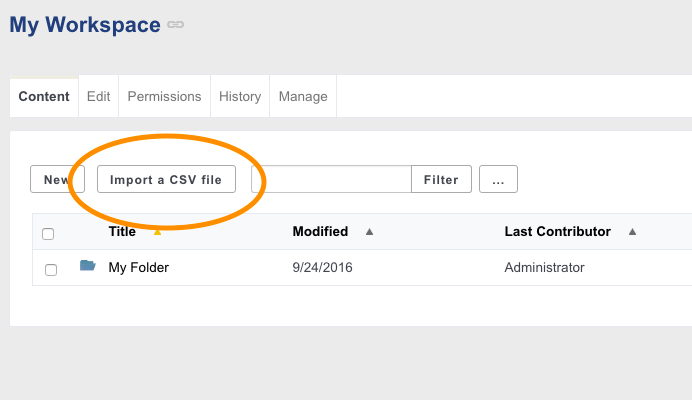 Select your CSV file then click the Process button. You are all set and importing! Once the import process has finished, you will be presented with a nice report of the results. Voila! Stand back and admire how easy that was! Visit the Nuxeo Documentation Center to learn more about the Nuxeo CSV bulk import.